It makes perfect sense. Burning buildings are very dangerous places for people to enter, so when there's a fire that needs to be put out, why not recruit robots to do the dirty work? That's exactly what Dubai Civil Defense is doing this year. The emergency management organization just bought 15 quadcopters that it plans to use for patrolling high-risk areas like industrial zones for fires. In the event of a fire, Civil Defense plans to deploy the drones to inspect the scene so that they can assess how best to handle the situation. They'll also use three drones while fighting the fire—one to do reconnaissance, one to assist firefighters, and one to take pictures for the media. "If a firefighter isn't going to do that, then let a robot do it. Once there is demand for this, it will revolutionise the industry," says Folmer Kamminga, managing director of the Dutch drone developer Geoborn who makes the Knight Hawk, a drone with heat sensors and a navigation system. Some day, the Knight Hawk could be able to fight fires autonomously. "By the time my grandchild enters this industry, maybe all they'll need to do is to press a button and robots will completely extinguish a fire." Sounds a lot better than running into a burning building, doesn't it? Well, just add it to the list of the good things that drones actually do. 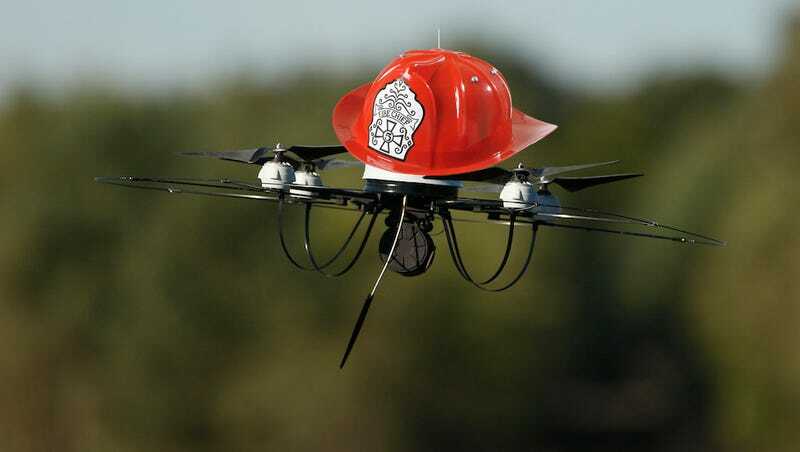 Of course, this won't be the first time drones have been used to help fight fires. Unmanned aerial vehicles have become an increasingly common part of the teams that fight wildfires. They're mainly used for spotting and aerial photography so that firefighters can try to predict what the wildfires will do next. It's interesting to see that same strategy applied to an urban center.